Most diagram components support the full list of automatic layout algorithms - check the comparison table here. Simulated Annealing is a general-purpose optimization method used to solve large-scale combinatorial problems by simulating the process of heating and cooling of metal to achieve freedom from defects. 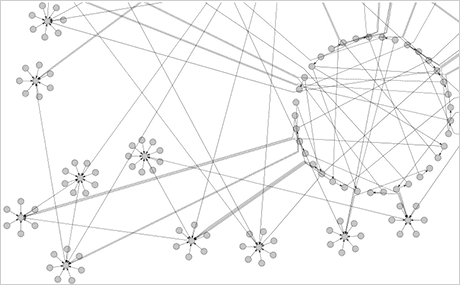 Finding a nice arrangement of a graph is a combinatorial problem that can be reduced to assigning costs to graph configurations and finding the minimum cost configuration. 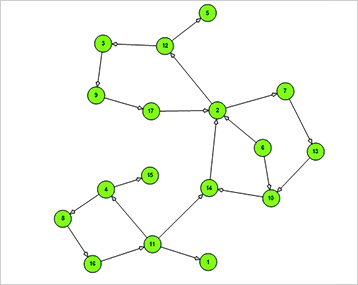 The sample assigns cost to a graph configuration by evaluating different aesthetic criteria chosen by the user such as distance between nodes, length of links and the number of link crossings. CompositeLayout partitions the diagram into several subgraphs and applies the algorithm specified via the SubgraphLayout property on each part. If the part is a tree, it is arranged using the algorithm specified via the SubtreeLayout property, which is set to a radial TreeLayout instance by default. Finally the algorithm specified via MasterLayout is applied on the graph that represents the overall partition. By running the polynomial-complexity layout algorithms on small subgraphs, CompositeLayout is able to process a large graph much faster than if a layout algorithm is applied on the whole graph. 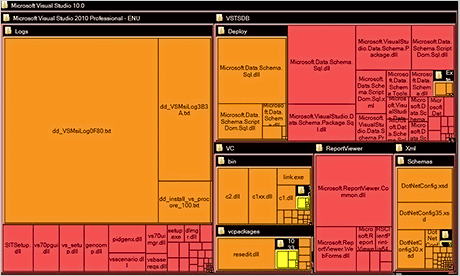 CompositeLayout can run on custom partitions specified as lists of nodes, or automatically partition the diagram via two automatic methods based on graph connectivity and graph path lengths. Set the PartitionMethod and CustomPartition properties to specify how the diagram should be partitioned. 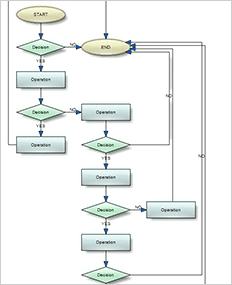 This algorithm arranges simple flowcharts consisting of decision boxes with up to three outgoing links per node and activity boxes with a single outgoing link per node. The nodes are arranged in columns and rows, whose distance depends on the HorizontalPadding and VerticalPadding property values. When links share the same row or column, they are placed at a distance specified via LinkPadding. The layout arranges nodes recursively starting from StartNode. If StartNode is not specified, the algorithm selects the root of the deepest branch of the graph's spanning tree as start node. Nodes at the lowest level are arranged directly in a circle around their parent. At the upper level, the already arranged nodes form branches that are arranged in a circle around the new parent node. The algorithm is recursively repeated till the highest level is reached. 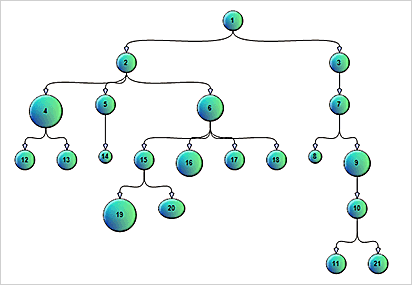 If nodes in the tree have uniform number of children, the end result has fractal-like appearance (subsets of the graph look like scaled-down copies of the whole graph). You can choose which node should be displayed at the center of the topmost circle by setting the Fractal property. 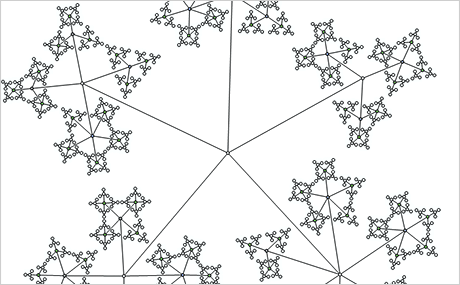 If it is not specified, the algorithm automatically selects a Fractal that leads to more balanced distribution of nodes. This layout algorithm can be used to arrange process diagrams in which nodes representing activities are placed in swimlanes representing resources. The index of the resource allocated to an activity should be assigned to the corresponding node's LayoutTraits[SwimlaneLayoutTraits.Lane]. By default, the algorithm works with the diagram's LaneGrid, but its SwimlaneGrid property can be set to any class that implements ISwimlaneGrid. This allows applying the layout to a custom-drawn grid rendered through the DrawBackground event, or one composed of locked background nodes. Spring-Embedder algorithm produces layouts having uniform distribution of nodes by simulating a physical system in which nodes repulse each other and the links between them act as confining springs. Nodes are moved around in an iterative Spring. The forces that act on a node are calculated, taking in account the positions of surrounding nodes and links from the previous iteration. This sample demonstrates animated 3D SpringLayout. The nodes are displayed inside a DiagramView3D control. Drag with the mouse to pan the camera. Hold CTRL while dragging to rotate the camera. Use the mouse wheel to move the camera back and forth. The TreeLayout algorithm exposes a Type property to select which tree layout algorithm to run, and call the Arrange method to apply the layout on a tree/subtree in the current diagram. 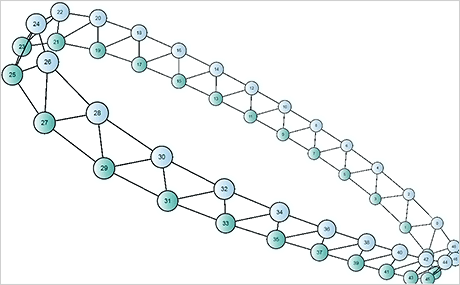 As long as the graph is a tree, the algorithm can find the root node automatically. You can override it by setting the Root property, e.g. in order to arrange only a selected branch of the tree. The distance between the root and the second level and between all subsequent levels can be set through the LevelDistance property. The distance between adjacent nodes in the same level is set through NodeDistance. Treemap maps represent hierarchies by nesting child nodes within their parents, where the areas of leaf nodes are proportional to their Weight values. Unlike other layout algorithms, TreemapMapLayout expects hierarchies to be defined via grouping or containment (see AttachTo method and ContainerNode class), and will ignore any links in the diagram. The diagram area covered by the topmost nodes in a hierarchy is specified via the LayoutArea property. By default, the layout tries to keep the ratio of node sides as close as possible to one. However this could make it hard to distinguish separate levels of the hierarchy. To alleviate that, set Squarify to false, and child nodes will be arranged either as a row or a column inside their parent node, alternating directions for each level. The drawback is that when Weight ratios differ greatly or nodes contain many children, some nodes could end up with very narrow rectangles.